A 500 year-old sandstone cross in the village of Meridien is claimed to mark the very centre of England. Just a few miles away another plaque erected on the wall of the Rugby School in 1895 is claimed to mark the birth of the sport that bears its name, inspired by its pupil William Webb Ellis who famously picked up the ball in 1823. 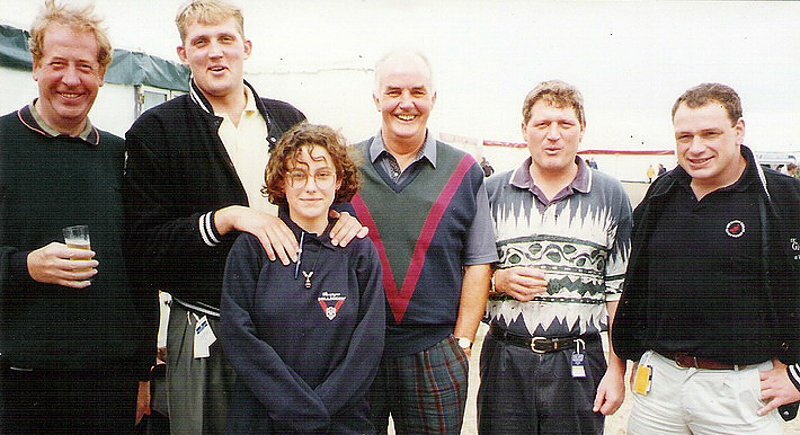 The Rugby Boys, left to right: David Brook, Doddie Weir (with a fan), Ted Niblock (Ex Dublin), Graham Briggs (Ex Sale) and the other guy on the right is also a Scottish. The name William Webb Ellis was to become indelibly enshrined in the history of Rugby. And this year once again his name will come to the forefront …it is Rugby World Cup Year and the leading teams of the World will be vying to capture the famed Webb Ellis Cup. But it was some years between the incident at Rugby School and the birth of the Rugby World Cup Tournament, and the path has not been without incident and issues. The style of football that developed at Rugby School became popular throughout the UK in the 1850s and 1860s. In 1871 the RFU was formed and the first recognised international rugby match was played between England and Scotland. In 1883 the first Home Nations Championship, contested by England, Ireland, Scotland and Wales was played while overseas and the Montevideo Cricket Club in 1861 became the first club to play rugby outside the British Islands. The waters were stormy. In 1892, the Northern Rugby Football Union was formed and the schism subsequently created “rugby league” and “rugby union”. The two codes went their own way. In 1910 the Rugby Union Home Nations Championship became the Five Nations Championship when France joined but it was another 90 years, in 2000, before The Six Nations Championship was formed as Italy joined. But it was Rugby League who staged Rugby’s first ever World Cup in either code in 1954 when Great Britain beat France 16-12 in the Paris final. The first Rugby Union World Cup was not played for until 1987, since then it has been lifted by four nations: New Zealand, Australia, South Africa and England. While never winners, Scotland has competed in every Rugby World Cup since the inaugural tournament. Their best finish was fourth in 1991 having been agonisingly eliminated by the runners up England but assisted by an inspirational performance by a certain George “Doddie” Weir on his World Cup debut. The giant lock that had come quickly through the Scottish ranks was part of the Scottish school’s team in ‘87 and ‘88, before at the age of 19 becoming the youngest forward to play for Scotland B in 1989. He was soon promoted to the first team, winning his first cap against Argentina in 1990. A glittering career saw him win 61 caps in seven years (and scoring 19 points), take part in three consecutive World Cup tournaments (1991, 1995, 1999), captain the Barbarians, play for the Lions (1997), as well as playing for 17 years with Stewart’s Melville, Melrose, Newcastle Falcons and Borders before retiring in 2004. Webb Ellis name is firmly established in rugby union folklore…”Doddie” Weir’s is certainly enshrined in Scotland’s.